Dónde Están Los Ladrones? (English translation: Where Are the Thieves?) 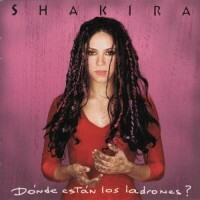 is the second official studio album by Shakira, released in 1998. Dónde Están los Ladrones? sold 7 million copies worldwide. The album is one of the highest selling Spanish-language albums in the United States. Two of the album’s songs garnered Shakira the Latin Grammy Awards for Best Female Pop Vocal Performance and Best Female Rock Vocal Performance. In addition, it was nominated for a Grammy Award in 1999 for Best Latin Rock Album.